While we are fabricating the MOSFET, we have to take care about the different material used based on the performance of end product (MOSFET) and so we can say that properties of the material (which material, doping, sizes …) come from the Fabrication of the MOSFET. In this post, I am going to brief you about the different Fabrication steps of CMOS device and some important info which will help you to understand different terminology + fundamental of lower technology node process. Materials can be classified in to 3 main groups as per their electrical conducting property. Used to isolate conducting or semiconducting material from each other. MOS devices and Capacitance require insulator for their physical operation. Which insulator is required – it depends on the functionality for which you want to use it. Conductors are used in the IC world for electrical connectivity. These are used as Local interconnects, Global Interconnects and in Contact/VIAs. This is the base of whole semiconductor Subject. Silicon is the known semiconductor material. Low cost because of easily available in the nature. Selective doping of various regions of silicon allows the conductivity of the silicon to be changed with the application of voltage. Other semiconductor material is GaAs but this use only for specific purpose/applications. There are lot of processing technology are available in the market but only few are very popular. 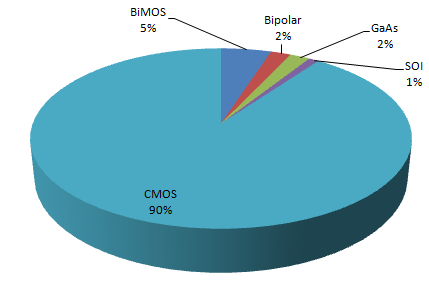 Out of which majority of production is done with Traditional CMOS. Others are limited to the area where CMOS is not very suitable (like High speed RF applications). ICs are created on Silicon Wafer. Silicon Wafer is a very think disk of intrinsic Silicon on which rectangular or square shape of multiple ICs are created. Individual ICs are cut with the help of diamond saw and marked as pass or fail after proper testing. On the basis of good no of die in a wafer, we define a term YIELD. We always try to achieve 100% yield but that’s the ideal scenario. In a mature technology node or say process Yield approximately equal to 90%. Always remember – Yield decides the cost of the chip. All ICs on a same wafer are processed at the same time, so the time taken and process steps are same regardless the no of ICs in silicon wafer. This means the cost to process a wafer is the same whether it has 1 IC, or 1000 IC’s on it or not. Lower technology node process (e.g. 45nm) has more number of die in silicon wafer in comparison to higher technology node process (e.g. 180nm). Now we will understand few of the terminology which is linked with the Fabrication and now-a-days are more know to outside world. I will not discuss too much about these because we need not to know the every details (like equations, equipment in each process and all) of these steps. I will try to cover as much as possible which is required/ sufficient for CMOS fabrication point of view. Note: In case you are interested in more details about this process, you can refer chapter 3 of VLSI Technology by S.M SZE. To provide the surface passivation (creating protective SiO2 layer on the wafer surface). It protects the junction from moisture and other atmospheric contaminants. To isolate one dielectric from other. SiO2 acts as the active gate electrode in MOS device structure. Used to isolate one device from other. To provide the electrical isolation of multilevel metallization system. 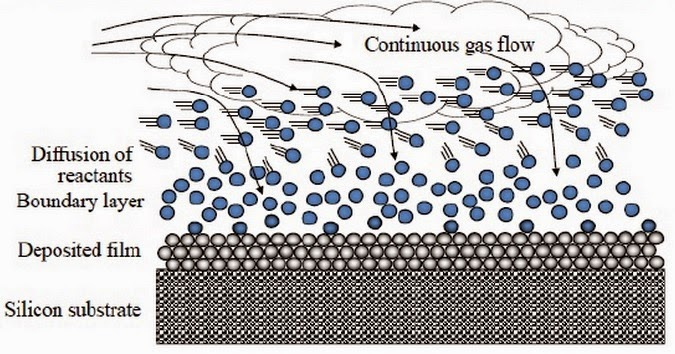 Several techniques are there for forming oxide layer and each technique has their preferred uses. When the interface between the oxide and the silicon requires a low charge density level, thermal oxidation has been preferred technique. When oxide layer is required on the top of a metal as in case of multilevel metallization structure, vapor-phase technique is preferred technique. Just as a general principal and which you will see later – When Silicon exposed to oxygen – silicon dioxide form rapidly. Remember – Silicon got consumed during this process. There are 2 ways of doing oxidation. I can help you with the equations. This process is known as Dry Oxidation. Form a thin layer of Silicon Dioxide. Hydrogen (H2) is the byproduct. Forms a thick layer of Silicon Dioxide. Note: above 3 diagrams are captured from CMOS Processing link. Note: In case you are interested in more details about this process, you can refer chapter 4 of VLSI Technology by S.M SZE. A technique used in IC fabrication to transfer a desired pattern onto the surface of a silicon wafer. The word lithography comes from the Greek lithos, meaning stones, and graphia, meaning to write. It means quite literally writing on stones. In the case of semiconductor lithography (also called photolithography) our stones are silicon wafers and our patterns are written with a light sensitive polymer called a photoresist. Process of lithography can be accomplished by selectively exposing parts of the wafer while other parts are protected. The exposed sections are susceptible to doping, removal, or metallization. Specific patterns can be created to form regions of conductors, insulators, or doping. 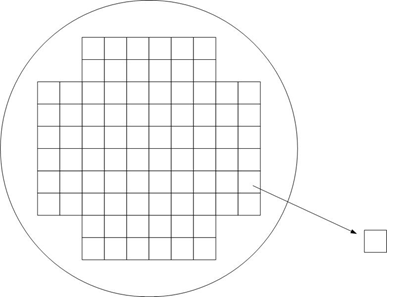 Due to the large number of lithography steps needed in IC manufacturing, lithography typically accounts for about 30 percent of the cost of manufacturing. Generate the Mask as per the layer pattern provided by Designer. 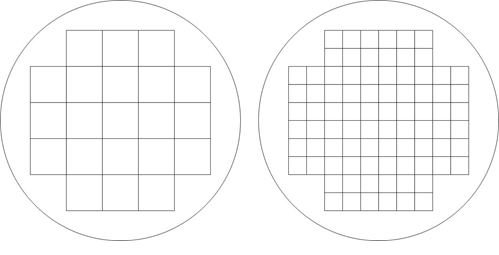 Transfer the mask pattern to the wafer surface. Process the wafer to physical pattern each layer of the IC. A material that is acid-resistant under normal conditions. We put the photo resist on a wafer. Mask pattern is developed as per the design. We pass the UV light and expose the photoresist region selectively as per the pattern present in the Mask. 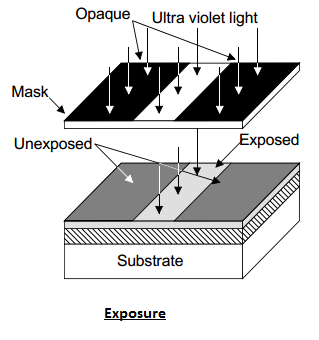 UV rays create a soluble pattern in the photoresist. Depending on the type of photoresist (negative or positive), the exposed or unexposed parts become resistant to certain types of solvents. Apart of UV light there are other type of exposing radiation are also present. Then we can soak the entire thing in acid/solvent and only the soluble photoresist (depends on positive or negative photoresist) is removed. 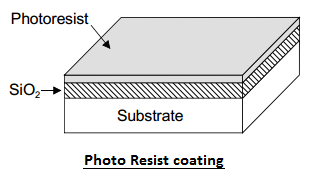 The developed photoresist acts as a mask for patterning of underlying layers. We can also say that this allows us to form a protective barrier on certain parts of the wafer while exposing others parts. Just few points about etching. More in details you can refer my other post. Once the desired shape is patterned with photoresist, the etching process allows unprotected materials to be removed. Etches can remove Si, SiO2, polysilicon, and metal depending on what we want to accomplish. I was just reading an article and like below definition of this step. I hope you will also like it. The Process which immediately follows the photolithography step is the removal of material from areas of the wafer unprotected by photoresist. Note: Copied the above diagram from Internet. These layers form wires and insulators that interconnect all the transistors of the device. Materials are divided into 4 categories. The films created by this method are uniform films with excellent step coverage. This method is very economical. Just chemical reaction is the limitation. It involves the physical removal of material from a target via ion bombardment. This is similar to sand blasting. Film material flies away from the target and adheres to the wafer, making the desired film. It can be used to deposit any material on any substrate. Because it’s a physical in nature and doesn’t rely on a chemical reaction. It’s a unique form of CVD. 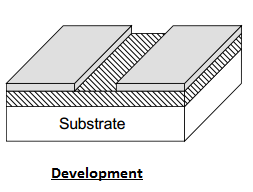 The purpose of epitaxial deposition is to grow additional single crystal silicon above the original wafer surface. It’s a very expensive method and only used in the MOS processing. The process of adding impurities (B, P, As) to a silicon wafer. Adding impurities are also known as doping. (ni -> NA, ND). The Impurities means ions are accelerated toward the wafer with the help of Electric Field and it tunnel into the crystal structure. With the help of Lithography process, we can add these impurities selectively. When we add the impurities into the wafer then it breaks the covalent bond of the structure. To improve/fix this damage, Annealing is the process. Below figure helps you to understand. In the next part we will discuss about the various discuss different steps in the CMOS fabrication (Mostly only by Pictures).